“All these things that are thought to be consumer services are coming into the enterprise”. In den USA vollziehen Unternehmen bereits diesen Schritt. Laut dem Dartmouth Center for Marketing Research, MA, weist Inc. 500 Index der schnellst wachsenden Unternehmen wei?t dort einen Anteil von 39% Unternehmensblogs (2007: 19%) aus. Selbst wenn ein dort zu beobachtendes Wachstum um 20% beim Einsatz von Video innerhalb der Unternehmensabläufe auf 45% dieser Unternehmen nicht direkt übertragbar auf hiesige Marktverh?ltnisse sein muss, sehen wir zumindest einen deutlichen Indikator f?r das Gesamtpotential. So prognostiziert Forrester zb. für das Jahr 2013 einen Weltmarkt von 4.6 Mrd US$ f?r Unternehmensanwendungen basierend auf Web 2.0 Technologien. 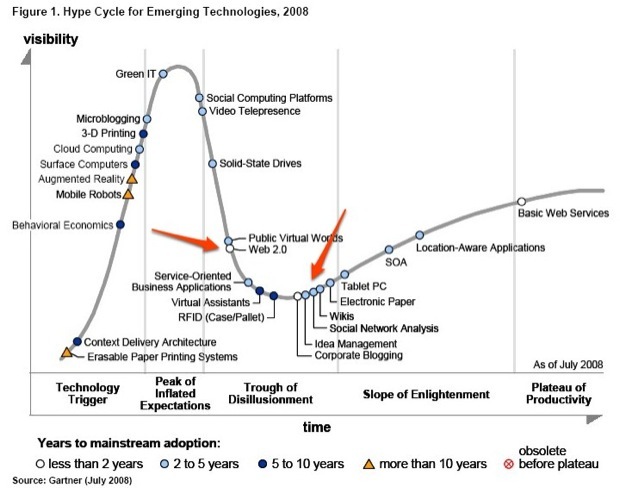 Gartner beschäftigt sich in einer Studie mit dem Hype-Zyklus neuer Technologien. Hier heisst es, die Einf?hrung von Web 2.0-Anwendungen ist nicht gleichzustellen mit der Zufriedenheit. Das Papier sagt 27 Technolgietrends voraus, die sich mittelfristig in Unternehmen etablieren werden. Acht davon sollen sich besonders stark auf Unternehmen auswirken. Dazu geh?ren vor allem: Green IT, Web 2.0, Soziale Netzwerke, Cloud Computing, Virtuelle Welten, Videoconferencing und Microblogging. Later — in between two and five years — cloud computing and service-oriented architecture (SOA), which is moving up the Slope of Enlightenment, will deliver transformation in terms of driving deep changes in the role and capabilities of IT. Finally, public virtual worlds, which are suffering from disillusionment after their peak of hype in 2007, will in the long term represent an important media channel to support and build broader communities of interest. THe following comes in cooperation with Bertram of gugelproductions. 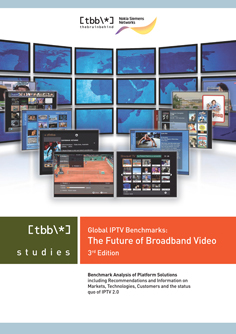 It is adapted to our findings in the IPTV Benchmarking Study “IPTV vs. WebTV”. Today, producers of motionpicture and TV contents can choose from an array of platforms to provide their work to a broader audience. Conversely, platform providers in most cases can pick from a multitude of contents to offer. In times of announcements of new video sites coming in almost by the hour, VoD or streaming offers both have to stay focussed in order to asses arising opportunities. Increasingly, a seperation between Internet TV as “Over-the-top” distribution and telco IPTV as a new “institutionalized” mean of distribution becomes hard to make. To provide a basic methodic famework for producers and platform owners, we assembled the following matrix, showing options for both sides. TV: Regardless of which transmission technology used – cable, terrestrial, satelite or closed, IP-based networks – programing pursued by TV always is being characterised by linearity. This delivery mechanism commands a high level of control by excluding all other forms of usage and signal only can be received and decoded by standardized end-devices. Access to this form of program supply is even being regulated by the government due to limited capacity fro transmission. TV alltogther is the most closed system. Broadband Offerings: They are determined by an on demand provisioning of contents. However, channel control is still very present on this delivery type. In this case it is not being excerted by dedicated network structures, but by specific technologies as DRM or special types of application, which exclusively are being able to receive and display these proprietary signals. Access to Broadband Offerings is not being subject to authoreties regulation. Neverthenless platform owners issue certain requirements and rules for incorporating contents to their platforms. 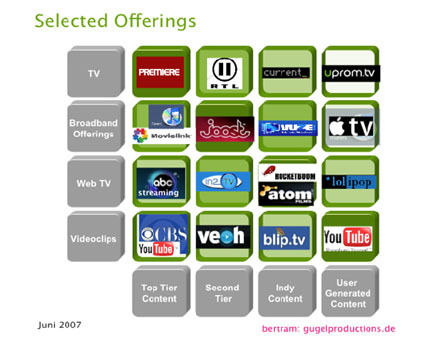 Examples: Joost, Babelgum, German Telekom’s T-Onlinevision, iTMS. Videoclips: On the bottom end videoclips or webclips make up for the most free abailable form of video content. In this class neither control of contents nor of their distribution exist. Producers and consumers enjoy both maximum freedom of choice. This leads to consumers becoming producers. Of course on demand accesibility is fully prevalent in this case. Examples are: YouTube, myVideo, Metacafe. Top-Tier and Second-Tier contents, Indy- and Niche contents and Prosumer- or User-Generated-Content. Top-tier: Expensive, valuable assets that carry the maximum possible returns . These Blockbuster-type of assets are being produced and exploited on enormous financial expenses. Second-Tier: Library titles and older shows, in most cases passed already all stages of the value chain. 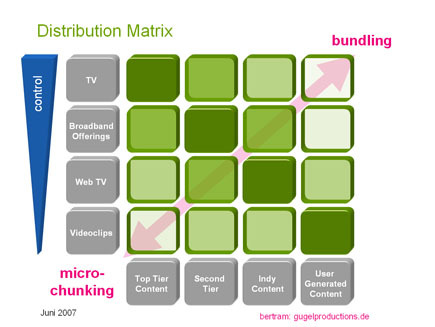 This classification resulted into 16 combinations of which platform owners and producers can choose from. In a next step stress on particular combinations of distribution and type of contents and describe related strategies. 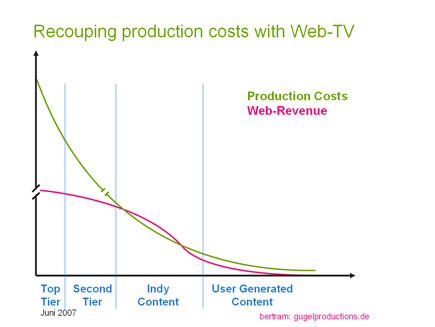 But first we look at the overall recouping opportunity of production costs via webvideo. 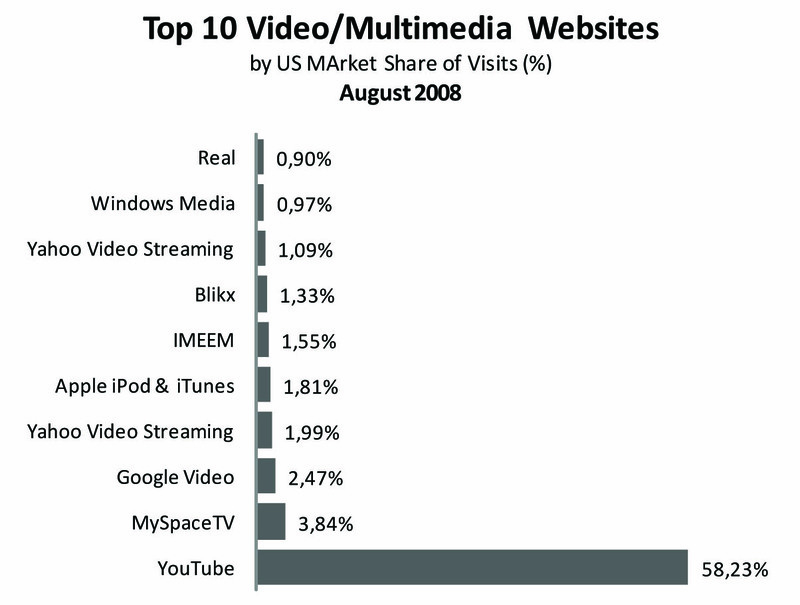 This figure illustrates production costs and obtainable returns from distributing video or film on the internet. The curve progressions in this illustration are ideal an rely on an educated guess. The curves shape there is depending significantly on factors quality/relevance, community, and succesfull management/marketing power on producers site. Following the occurence of those factors revenues can be siginficantly higher or lower. Next we selected four major generic strategies, the other 12 product/market combinations will be listed in short form only. Top-Tier Contents are increasingly offered as microchunked webclips. Perhaps the most known example in this field is “Saturday Night Live”. In the meantime there are not many premiers of shows or films left that haven’t been promoted on video platforms beforehands. Primary goal behind a Top-Tier videoclips strategy should always be to generate and increase demand on complementary platforms. We have witnessed various efforts to merge UGC and regular TV progaming before. Discussion on a YouTube TV channel are still going on and by its Ziddio portal Comcast setup a site aiming to move UGC videos straight onto the TV screen. Even ABC announced such a show recently with the i-Cought show, planned to be based completely on UGC. Rocketboom is the poster child of another combination. They are positioned around a sweet spot, being made up by a high fit to typical demand and the internets very own characteristics of a match between Indy- and Prosumer contents. Broadband Offerings combined with Second-Tier contents have gone large latest since movie download offerings appeared. Second-Tier is repeatedly being used for trialing platforms and asses opportunities. Joost is one example here, although they are (as many others in this lively market) a hybrid between Indy and Second-Tier distribution.